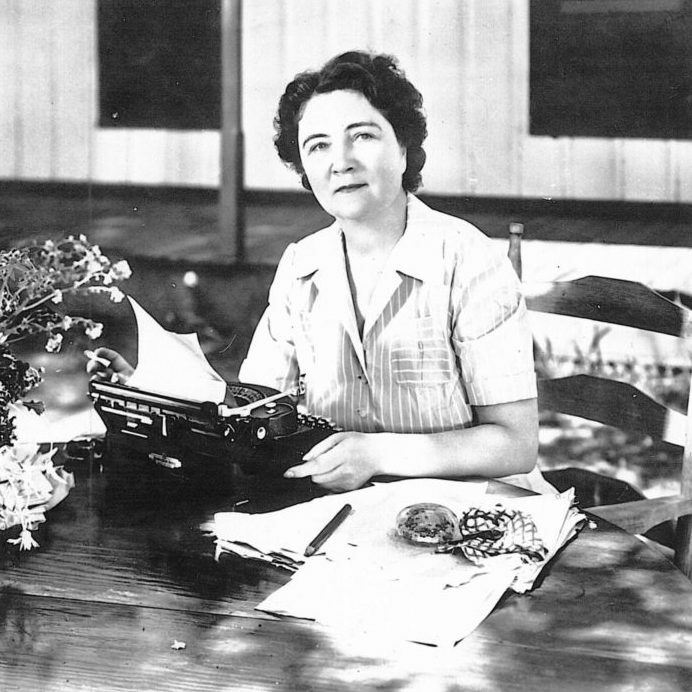 Marjorie Kinnan Rawlings, Perhaps the best known of Florida authors, moved here in 1928. She was born in Washington, D.C., graduated from the University of Wisconsin in 1918, married, and spent a decade at writing jobs across the nation before settling at Cross Creek, near Gainesville. There she developed a simple life that gave her inspiration. In 1930, she sold a collection of stories about Florida to Scribner’s Magazine that brought her national fame. She won the O. Henry short story prize in 1932 and issued her first novel the next year. Her classic short novel, The Yearling, was published in 1938. It won the Pulitzer Prize, was the year’s bestseller, and was made into an Academy Award-winning movie in 1946. Rawlings made her home in St. Augustine after 1941 and published her autobiographical Cross Creek the following year. She won a second O. Henry award in 1945 and even published a ‘conversational cookbook’ featuring Florida foods. Awarded several honorary degrees and elected to the National Institute of Arts and Letters, she died from a stroke at 57. She is buried at Cross Creek, where her home is open to visitors.